As you already know, 53rd Street has already closed, Bay Ridge Av will close April 29th and Prospect Avenue will close June 5th. The RFP for "Package 2" was awarded April 14th, and I assume it will start sometime in the fall/winter. The RFP for "Package 3" is being prepared and will go out in the next few months. In light of the fact that 145th Street on the 3 train is among the stops that are slated for the Enhanced Stop Initiative, will they finally work to extend the short platforms there to accommodate the current ten car length that is used by the 3? Nope the switches is short of the station south and the curve up ahead. Or just move the switch north of the station... nah, too expensive. Anyway, with 148 St so close, I don't think most riders in the last 5 cars would mind having to wait a few minutes to get off at 148th, or walk the extra few blocks. It's not like 145th is a major source of riders, unlike South Ferry, which is that plus a terminal and transfer hub. The nearby switches are only part of the problem. The main issues that prevent the extension of the platforms at 145 Street are the junction to the 149th Street tunnels to the south and the aforementioned northwest curve of the Lenox Ave line directly to the north. Even if they were to relocate the scissor switches north of 145 Street, any platform extension to the north would simply create the same problems found at South Ferry on the loop track and at 14 St-Union Sq on the Lexington Ave line. Location: Along the busiest line in the subway system. 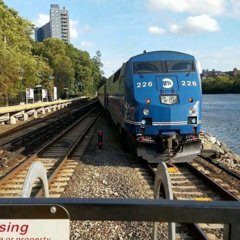 After South Ferry is shut down, 145th Street will be the only remaining 5 car station in the system that's still in operation. The Concourse line is going to be hectic when two or its stations close. 174-175th Streets and 167th Street are stations that have a ton of commuter traffic, whether that be on the weekends, rush hour, or midday. That's more time removed from people's schedules because there's a long distance from every station on the line. Going to Tremont Avenue with access to express trains or going to 170th Street. Going to 170th Street or 161st Street-Yankee Stadium to either take the to missed stops or transfer. Shuttle buses won't help on bit, partly because on how much people live near the impacted stations. 174-175th Streets isn't near any actual crosstown buses (other than the Bx32) and as a result, these shuttle buses will have to be placed at Mount Eden Ave//Grand Concourse. That's just my take on it, but thankfully this is not happening anytime soon. Any opinions? There's no tiles down there anymore. They were all ripped out when upper Bergen got rebuilt after that fire, it's all bare wall. There's still about a year or two for the MTA to figure out what they're going to do with the station closures as the stations you mentioned are listed in package 8. Besides, the Bx1 and Bx2 run along the Concourse line at those two stations. The B9, B37 and B63 are adding to people's daily commutes right now and yet those are the only alternatives for the Bay Ridge Avenue closure. I think that 137th Street on the train needs a renovation. Many of the stations north of 42nd Street were quite clearly last renovated in the 1950s and 60s, since they are covered with the ugly 60s tile scheme. I can't wait until those stations get their original tile schemes back. As for the el stations, none have been renovated except for 125, Dyckman, and 231 Streets. It seems like those el stations would be slightly cheaper to renovate than usual, since they have very short windscreens, and narrow platforms. This is especially visible at 231 Street. Yeah but even 231st wasn't a full renovation. Same is true of 238th and 242nd, though they should've been. The took shortcuts at all three of those stations and did a half @ssed job. 238th only has ONE MVM machine and the stairs are incredibly old. The only thing they seemed to work on were the actual platforms. They didn't do much in terms of the signage and the station that received the most work was 242nd, but it was also in TERRIBLE shape. I remember when I first moved to Riverdale, my friend drove me to that station so that I could get express bus Metrocards for the both of us to head to the city, and coming out of the station, I thought I was going fall through the staircase, that's how worn out and weak it felt. Oh, my original post was wrong, then. I didn't realize that 242nd Street was renovated. I'm not sure about 238th. If it was renovated, it must have been later than 2012 since pictures from that year show it as being unrehabilitated. Yes, it was renovated, just not fully as it should've been... Not sure why.... 242nd was finished recently. That was a full rehab, as they re-did the stairs completely since they had no choice but to. Hopefully they address the pigeon crap everywhere too. Yeah, 125th was a joke of a renovation too. Those short windscreens are leaning like crazy and there's plywood all over the southern portion of the platform. 125th street doesn't even look like it was actually renovated. Speaking of El Stations, is it easy to add platforms to an El? The should have a Union Ave Station. "Transfer Is available to the train"
It would be a lot cheaper to extend the Lorimer Street platforms 120 feet to the west (to make them 600 feet in length), and cover the rest with a transfer passageway. They also rebuilt the side platforms and Van Cortlandt Park, for at least 3 months the walls on the side platforms were missing. It needed everything it got. Did they put in new MVM machines? There's like two credit card only machines and two of the big ones, and usually only one of them works. I got so sick of walking all the way down the hill and not knowing if I can refill my Metrocard, that I just stopped altogether. I either do it in Manhattan or walk to Metro-North in Riverdale and refill once I get to Grand Central. Then Lorimer and Hewes should be demolished. Which of the options would be cheaper/easier/quicker to accomplish?